Based on the venerable Sprinter platform, the Hymer Van S comes outfitted with an easy-to-live-in layout and top-notch features. 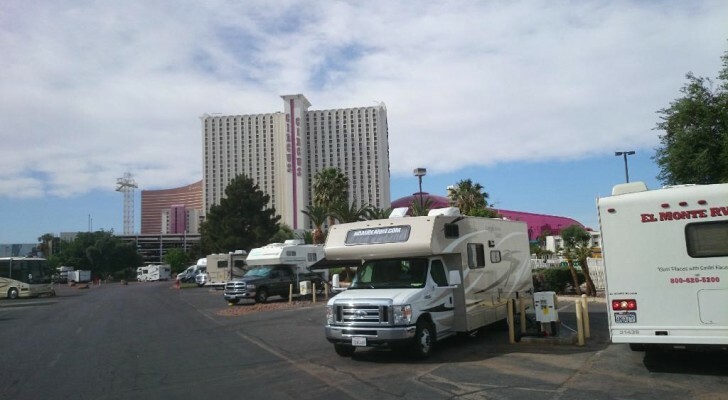 With the creation of the Sprinter, Daimler Chrysler created a whole new platform for the small motorhome RV market and van converters to experiment with. It’s unique height was a huge upgrade from the old school conversion vans that required special addons to get enough headroom to stand upright. Meanwhile, the wheelbase is not that much larger than a traditional cargo van, making the Sprinter easier to drive and park. The Van S is built on the Mercedes Sprinter platform. 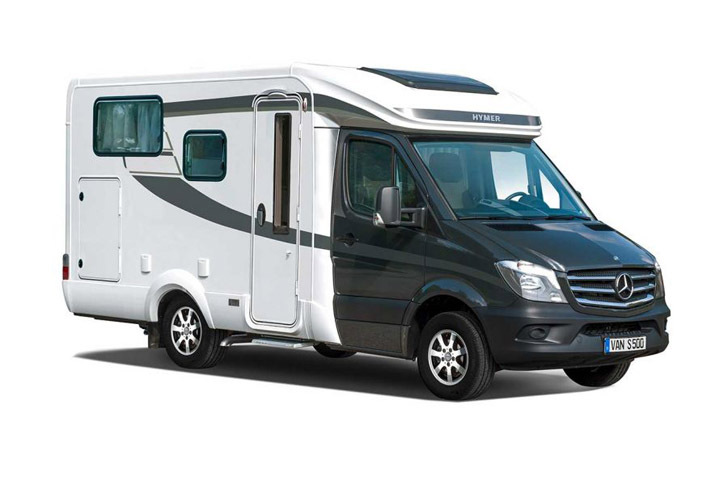 The Hymer S is built on the Mercedes version of the Sprinter, with a custom, integrated camper box that is built in, with two different floor plans. 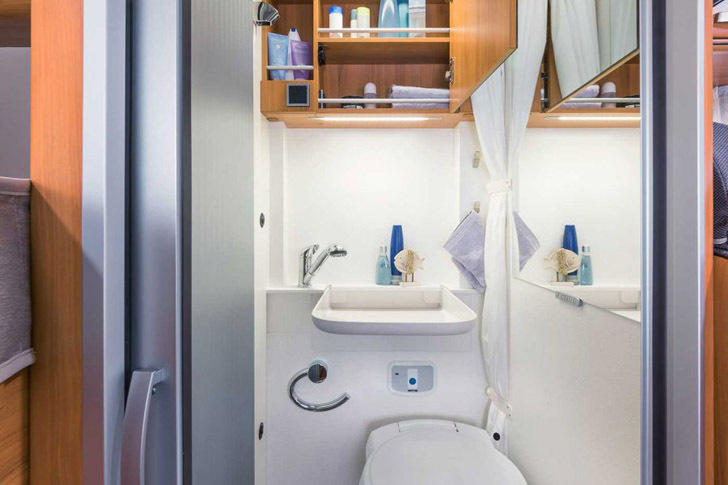 Each Hymer camper provides separate living, kitchen, sleeping and bath areas that are integrated to create a large living compartment that maximizes space while attempting to maintain comfort. In this view the cab seats are turned backward to face the living area. 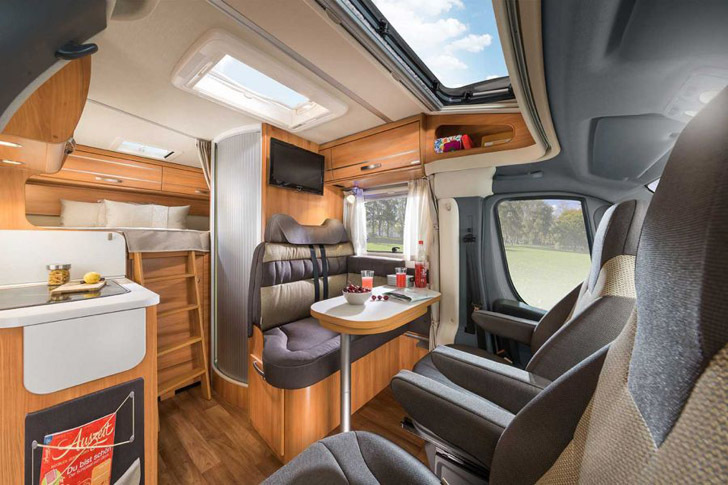 Over the seating area, the Hymer features a ventable roof light that tilts open for fresh air when wanted. 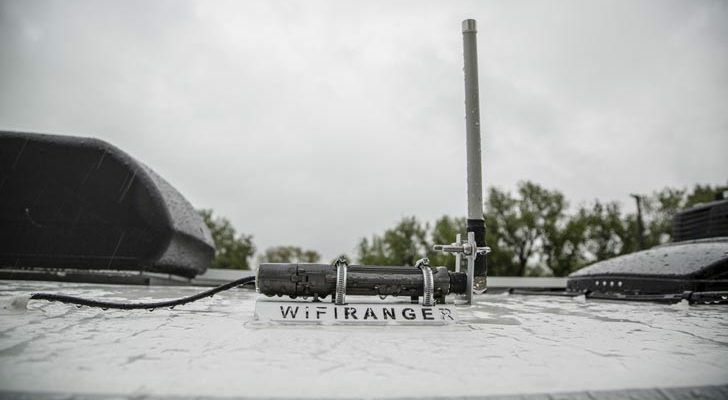 It comes equipped with closable blinds to control the light and keep out insects while maintaining ventilation. 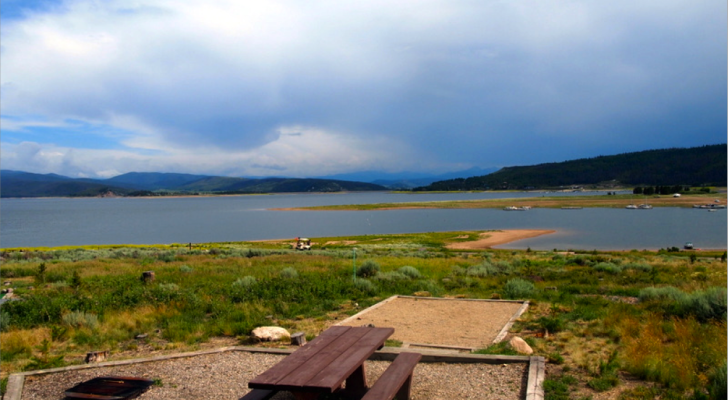 Natural light is a must-have in any RV, as a well-lit interior makes the small living space feel more open. 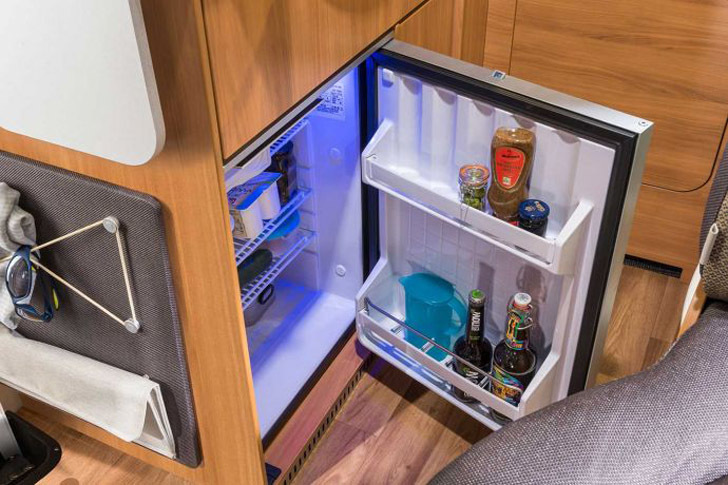 The Hymer’s kitchen is petite – but serviceable. 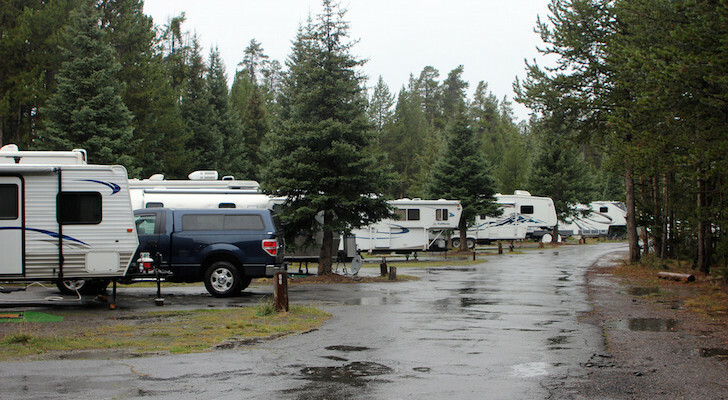 Storage space is always at a premium in RVs and campers. 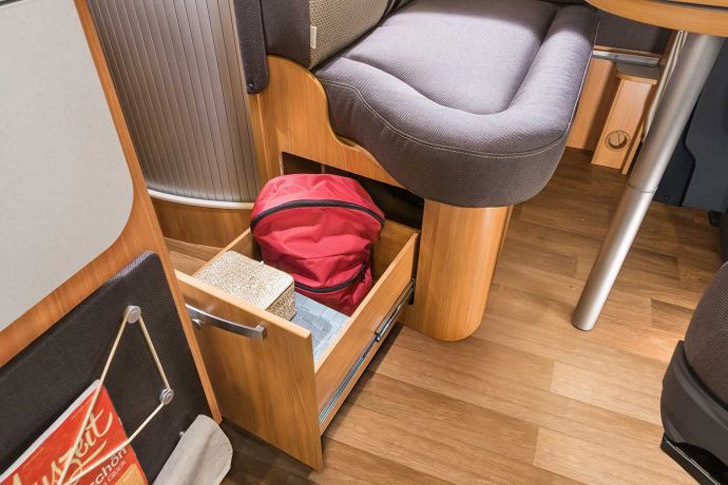 The Hymer addresses this issue with ample integrated storage in unused spaces, like under the bench seating of the dinette. The pull out drawer allows for easy access to cooking items, unlike fixed cabinets that can make things hard to get to. The built in fridge nests under the kitchen counter, note the folded worktop on the left. Sleeping quarters are in the rear, above an externally accessible “garage” storage compartment. 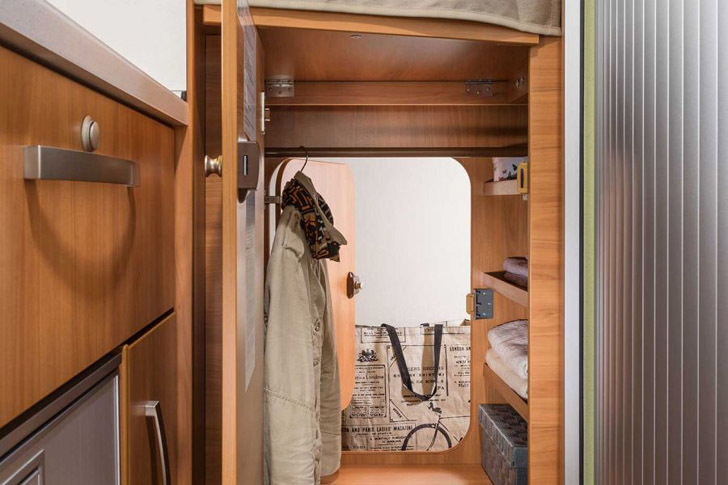 The berth provides ample room for two adults to sleep and is attached to an integrated wardrobe space that is also accessible from the garage. By opening up the wardrobe to the garage, large items can be loaded through the wardrobe directly. 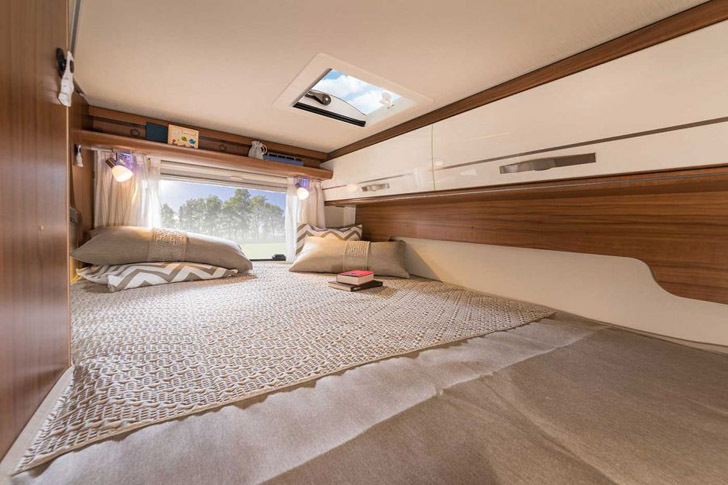 Hymer’s master bed looks tight but cozy, with lots of light and an overhead hatch for ventilation. 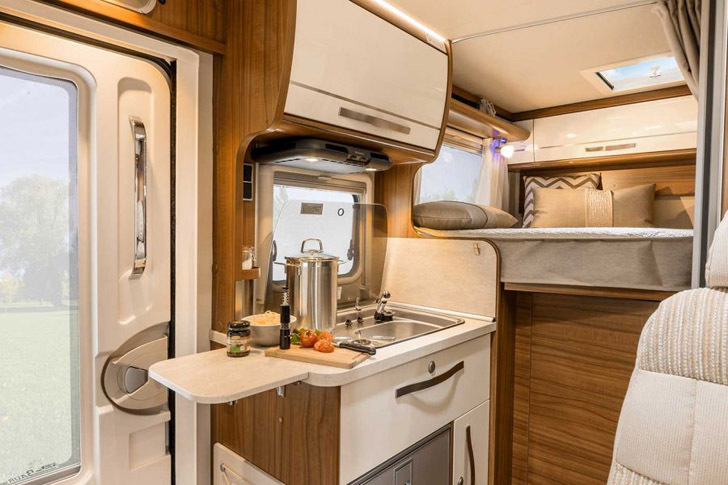 The kitchen in the Hymer features a two burner stove and a small sink. Underneath, a small fridge and kitchen storage drawers provide plenty of room to stock your pantry for trips. Built into a standard height cabinet, the kitchen is conveniently located near the dinette for easy service. The kitchen drawers and doors are equipped with single hand operable locks. Designers added lots of storage, including small cubby units like this under-seat drawer. 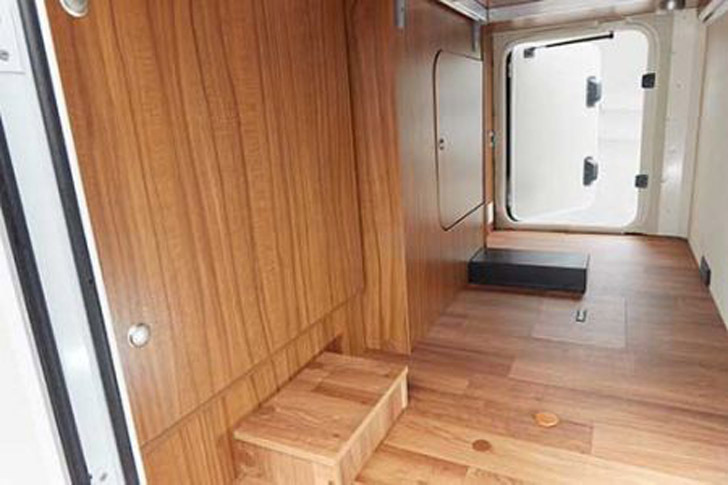 Because of the limited space, Hymer chose quality over quantity in the bathroom compartment. The bathroom features a toilet and folding wash basin that folds down over the toilet for use. The door of the bath compartment is a pocket door that provides a clear passage, even when the door is open. The wardrobe with a passage to the “garage” in the rear, bath on the right. 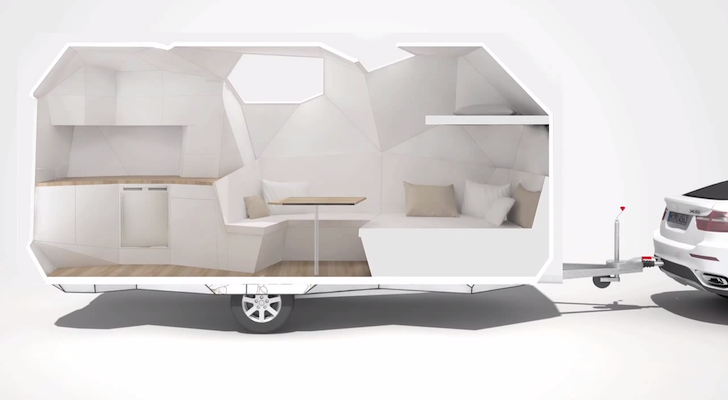 Insulation is a primary concern in the Hymer’s design. The undercarriage conceals the water tanks, which circulate warm water through the floor, keeping it warm and helping to keep plumbing from freezing. Other high tech features include LED lighting and sound and TV wiring throughout for easy digital entertainment integration. Hymer’s small bath, with the washbasin folded down for use. The exterior accessible “garage” under the bed platform, with access to the wardrobe. For a small motorhome, the Hymer is feature-rich. 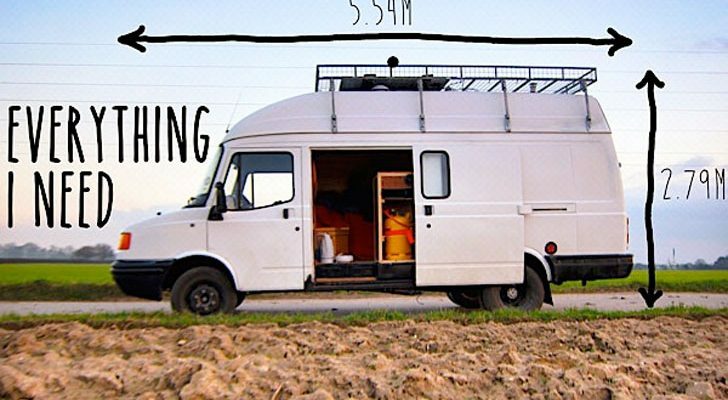 While the quality of construction looks good, the space is somewhat cramped and is probably better suited to roadtripping RVers than those who choose life on the road long-term. 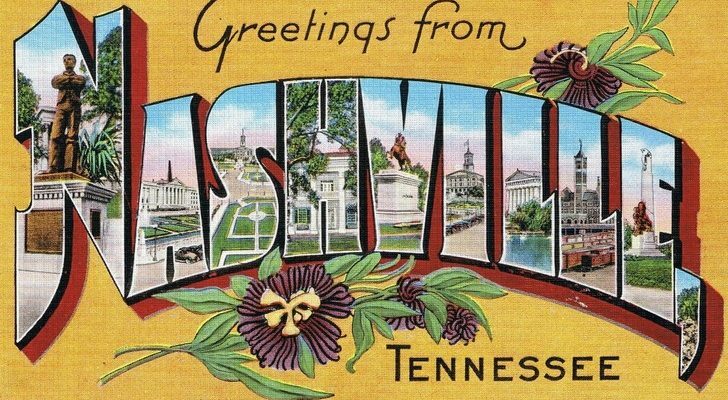 Hymer has dealers throughout Europe and Asia, but unfortunately we couldn’t locate a US-based dealer via their dealer search form. 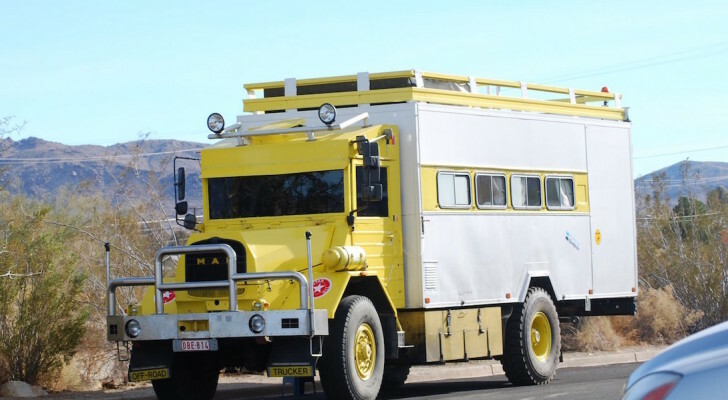 To learn more about the Hymer Van S, visit Hymer’s website.